Spread half of the crushed wafers in the bottom of a greased 8-in. square pan. Prepare pudding mix according to package directions; spoon hot pudding over crumbs. 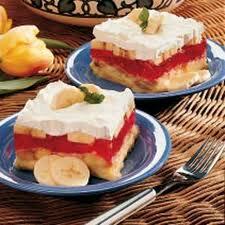 Slice one banana; place over pudding. Top with remaining crumbs. Chill for 1 hour. meanwhile, prepare gelatin according to package directions; chill for 30 minutes or until partially set. Pour over crumbs. Slice the remaining banana and place over gelatin. Spread whipped topping over all. Chill for 2 hours. Yield: 9 servings. *NOTE: My mom, Ruth, made this on a warm summer evening for dessert…so refreshing and cool…the perfect end to a summer meal! Of course, I wouldn’t turn it down in the winter either! We always LOVE to hear from you! Pop us an email, leave a comment in the box below, or of course, STOP by to see us at Adrians! It’s easy to get our email updates…just text ADRIANS to 22828 to join!